Pros: Mailjet is quite easy to set up and use. 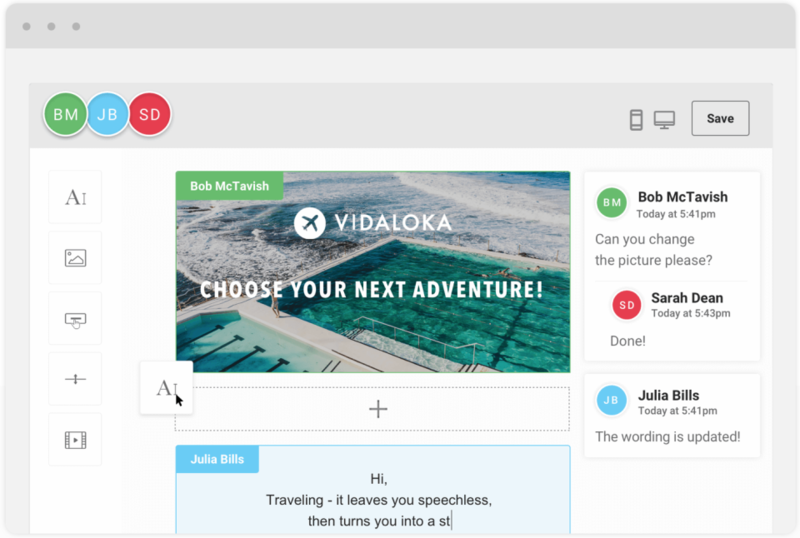 The latest improvements that were implemented this year make the creation of nice looking emails for different platforms very convenient. User-friendly, colorful and intuitively understandable. Cons: The most irritating thing about Mailjet is when the account is blocked for some reason and you message to the support they just say "Sorry, your domain triggered some of our security rules. We unblock your account". They never say what exactly is incorrect with the domain despite the fact that it could help their customer to improve his domain security or change the hosting. Or as another example, when you have just created your account, you may get the message "Sorry, your domain triggered some of our security flags. We cannot allow you to use our system." No any other clarification what exactly their security system didn't like. And you have to go to their competitors. Overall: In general I like Mailjet. You set up it once and you forget about it because you know that it is running like clockwork. I always recommend it to my colleagues. Longtime fan and user for years. Pros: MailJet is targeted more at being used for email marketing, but it is the perfect solution for 3rd party applications that require SMTP service but for one reason or another an organization cannot use their own mail server. (Also allows tracking for those 3rd party app mailings if you want to get fancy.) It's been my go to through several employment changes where I always end up needing it for one thing or another, and I've recommended to clients many times over. The support is always fantastic as well - they've always been responsive and on top of things, even when I was only using a free account. This has made them the first SMTP service I think of, always. In the years I've been using it (I think I first discovered them 4 or 5 years ago - not exactly sure how long, I've experienced an outage or two. Frustrating when it happens, but then any internet service is subject to that from time to time. Overall: Allows 3rd party applications to send email without having to open up security on mail servers, and does so with ease. Pros: MailJet is extremely easy to use and makes the process of generating mailings extremely simple. 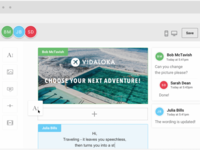 The UI for generating mailings is intuitive and simple, yet powerful and able to accomodate pretty much anything you'd want to put into an email. I use it generally for doing newsletters to a large group of about 5,000 subscribers. The overall interface for managing Contacts lists and Campaigns is well done and understandable. Adding and removing subscribers from Contact lists is fairly straightforward and mostly great. On the rare occasions when I've needed support, they've always been extremely fast and knowledge-able, and solved the issue in short order. 1) There doesn't seem to be any way to automatically remove Unsubscribed Contacts: you have to download them manually, then upload them to remove them. 3) Errors from uploading new Contacts is a little clunky when there are errors: again it generates a file that you have to download and look at separately. For most errors (duplicate address, typos, invalid format, etc) in the little uploads that I do as part of expanding the list, I'd just like to see the darned things immediately on the screen so that I could either ignore them (i.e. dups) or fix them (typos & invalid format). Only if the errors go beyond some threshold (say more than 10, and it could be user-settable), should it do the file-generate-and-download thing. Pros: I like the amount of flexibility you have at the free level. I like the ease of dragging and dropping content to add or reposition. I like that it saves as a work in progress and you can go back and review old newsletters. I also like the detailed insight and stats. Cons: That you can't move multiple sections at once. For example, I wish you could highlight a text box and an image at the same time and move them around together to relocate content. I also wish you could add dividers between vertical columns. If you have a 3 column section, I would like to divide with a line between. I wish there was a calendar feature as well to help with showcasing dates and events. Overall: This works really well for what I need. It is easy to use and easy to train people not so tech savvy to use as well. Aside from the cons above, I have had a great time updating content. I do with the help people we a little more helpful. When I had a problem in that the emails we saying "sent" but nothing was being received - they told me it was my problem and there was nothing they could do. - That may be the case, but there are nicer ways of saying this. I had already checked my email spam and the head spam blocker and nothing was there from mailjet. I ended up having to send out a link to the online version that I had pulled off of a previous test email. That all being said, I still continue to use the program as it is easy to manage and provides nice stats. Cons: There seems to be some question about the definition of a transactional message. My client's emails that resulted from visitors filling a form (a transaction, I would say) were blocked based on content filters and the support team didn't have a really good answer as to why, other than quoting their policy that the service is for sending bulk or transactional messages only. This issue may have been cleared up in the meantime. Overall: The number-one unique feature that Mailjet provides is MJML with a drag-and-drop builder. Hands-down the best way to roll out anything from an MVP email for testing to a full-fledged transactional messaging system. The close integration of the Builder with the Send API to dynamically populate the messages is AWESOME! Separating code and design is definitely a goal that this can help you achieve. I love being able to send through SMTP. It's a huge plus for managed WordPress hosting environments where it's impractical to run a mail server. I also really appreciate the Mail Parse API, which allows me to focus on processing inbound emails via webhook and JSON -- no messy content or attachment handling. The freemium setup, as of early 2019, is sufficient to run small operations for $0, and then the entry-level paid plan is such a good value after you outgrow the free level. I recommend Mailjet to all my clients who need mail sending or receipt/processing. Pros: Mailjet is very easy to setup as long as you have access to your domain DNS settings. I manage DNS through Amazon Route 53 so changes reflect quickly when I needed to verify DNS ownership. Once you confirm ownership, setting up email API is easy, and works instantaneously - as it should. I started using Mailjet to send out server and website notifications. For this purpose it worked awesome. I had about 20 websites sending notifications out via MailJet and as long as the domain names were verified correctly it worked great. You'll run into problems if don't verify your domain so if you have issues check that first. Mailjet has an easy domain verification tool that will highlight any issues quickly. For transactional emails and general emails from an email client MailJet worked fantastic - read the cons section for an area of trouble. Cons: Since I had such good success using MailJet for our transactional needs, I started using MailJet a couple months ago to send out periodic marketing emails, it's a native feature within their dashboard so I thought it would be nice to consolidate email providers. Well, very quickly we ran into issues and they temporarily lowered my sending limits. I was able to quickly provide them with the information they needed and they removed the sending limits after 7-days. From that experience, I limited our use of MailJet as a marketing platform, but recently used them again only to run into the exact same problem. But this time the issue was because of the volume of emails sent - not because of any bounce or SPAM notifications. The suspension this time resulted in a much more complicated process in demonstrating ownership over the list of email under my control. I don't want to pick on MailJet too much on this subject of marketing emails; they position themselves as a transactional email platform, and for that, they're awesome. I only used MailJet for marketing purposes because they feature it in their dashboard and it's easy to use. But they seem far more strict in their email purposes than say MailChimp which seems to be setup more for marketing/newsletter type emails. Overall: I use mailjet in daily work and keep in mind if one of the clients asks for advise or recommendation. Mailjet offers and provide so many working services and features that while one implements them there is no time to think about the shortcomings. Overall: Overall, it changed my life for the better. I have a newsletter that I send out to almost 5,000 weekly. Mailjet has earned me new business, makes it EASY to create my newsletter. I haven't mastered segmentation yet, but, out of all the other platforms. Mailjet took me to a higher level with better "reach". I would recommend this to anyone that truly wants to increase their marketing exposure. Pros: The Customer Support is excellent. They are very proactive about identifying delivery issues, and are often introducing new features. Cons: I wish it kept logs longer to help troubleshoot issues after they have happened. Overall: Sending large amounts of email from our ecommerce website, both of a transactional and marketing nature, is hard. Mailjet helps make this easier, and helps get our emails to our customers, and consistently offers excellent advice and functionality for making this work better both for us and for our customers. Pros: As we have to be sure that all the mails from our store goes to our customers, we did search for an easy solution. Mailjet is easy to configure and very stable. It was very easy to connect Mailjet with our Storesoftware. In I think 4 Years of using Mailjet we had to contact the support 1 time, they did help us very well. Pros: The website gives me the correct information to set up the connection. Good support service when neaded. Fast and reliable. Usefull statistics and reports to download. Cons: Blocked emails are not always easy to detect what the real reason is. Sometimes mailjet blocks the email address themselves. Sometimes the reason is the owner of the email adress, etc. Not easy to unblock the address that is blocked by mailjet. There is no control on that, as far as i know. Comments: Mailjet is a simple way to send emails, manage campaigns and have good control over marketing campaigns. Very simple to use and with good technical support always ready to help. For the development of my web applications and the sites I create I always use the service to be able to control the emails and to have in an instantaneous way all the dashboards that help me to perceive the state of the emails sent. Comments: Mailjet is our go to solution for deploying emails from webforms. We use mailjet on almost every website we do for our clients who can't or won't provide their own SMTP solution. Pros: Free! At least for our limited use case. Simple to setup and confirm new domains or addresses. Can manage multiple clients' needs through a single mailjet account. Cons: The limitations on the free-tier account are fairly low (200/day), but its free so its hard to complain. Recommendations to other buyers: Give the free tier a try, you'll probably get hooked. Pros: I love the the easy n smooth mail sending quality of this software the most but rest of functions and services also awesome like customer support ,Templates,SMTP etc. we are glad to hear you are happy with our service! Thank you for taking time to leave a review. Pros: This is the perfect solution for my needs: I define the email templates in a nice editor, get an ID, and then from my application i just call a command to send that email using the ID, along with my parameters. And somebody else (who is way better than me in this) is taking care of the sending, spam, opened/read etc. It works great, requires very little from my side, looks like it is ready to scale, I'm very happy! Cons: The email editor is where i spend most of my mailjet time. It is very good, but could be even further improved. Working with variables could be better and easier, validation at the editor could help in avoiding errors later, etc. But again, the tool gets A today, and I'm asking for A+. Overall: 1. I don't have to write and design emails manually. 2. I get a very scaleable sending solution with zero efforts. 3. The templating engine lets me easily put a face of a big operation, while I work from my basement. Support was friendly, not always very efficient, but solved most of my issues, or at least pointed me in the direction. I'm in the free tier yet, so can't complain too much. Overall I'm super happy with mailjet. Thank god you guys exist. Nothing to add. The level of service and reliability is unparalleled. Pros: Ease of use, reliability, user friendly experience, statistics and its exporting. In 5 years of use, not one problem. Cons: Sometimes the user interface is a bit sluggish, but i don't know, it might be a browser problem, because most of the times it runs without a problem. Thanks again and have a good week! Pros: It's an excellent mail service that I've had zero problems with. No outages, nothing. Which means I have no headache in trying to get something to work or maintain it. Cons: Nothing, I honestly can't think of anything other than it's not free, but I pay a pittance for what I do get to use, which I can't complain about because it's so well priced. Overall: It's a solid relay service which I can wholeheartedly recommend. we are sorry to hear that your experience on Mailjet was frustrating. As you said, we do offer a very competitive price, but we do our best to remain an accessible and reliable platform. That¿s why customer feedbacks are highly valuable. We constantly improve our template gallery, this said, we take your remark into consideration and forward it to our design team. Also, our support is available for any request regarding a problem you face with our service. We are sure we can walk you through solving any situation you may have. Thank you for taking the time to review us & we hope to see you soon again on Mailjet! Pros: Its easy to use, simple, and cheap for ammount of mail they offer. Cons: I couldnt find option to read sent mail (to see mail content). Overall: We are using mailjet services for years, we are hosting company so we send big ammounts of mails, before we started using mailjet, our mails went to spam, and we have been oftenly listed in spamhaus dbl, but since using mailjet, we do not have that problem, and our mail score is now good. I thought it was going to be difficult to setup but it was a breeze! Pros: The thing I like most is that as a service it just works, the end. I have never had any service related issues from Mailjet. Cons: I hate to say nothing but so far I have had no complaints with the product or the service. So far all has been exactly as promised. Overall: The biggest benefit is of course to be able to mass mail without having an issue with getting your own email server liste. Pros: I like the ease of use. I would like to Mailjet improves backend area implementing differents wizard tools. For first, I believe it's important send directly e-mail from admin panel. Cons: I don't like how "relay" works. Each e-mail message is delivered just like a newsletter subscription. Overall: I have a better delivery about all e-mail messages. Pros: High deliverability, good configuration options, good account management interface, very good support. Cons: Some unexpected blocked emails recently, apparently with no reason; not so easy browsing details of the stats. Thank you for leaving us a review. We are happy you like your experience with us. Pros: I am long time with this software. I am familiar with all functions. Cons: I have contacts divided in groups. I open on group of contacts and inspect each contact separate. When discover that one contact in group ACTIVE is no more active, I want to send this contact in other group. Until yesterday near mail address, I have option SEND TO. Click at this option and in drop down menu I have opportunity to chose among all groups of contacts. Click at one of them and my contact is copied in new group for example - NOT SO ACTIVE. You are cut very useful function for managing. Why? Overall: I would like that your manager try to work one month serious business campaign with this software after newest changes. Mailjet has been perfect as a mail relay. Pros: The best thing about Mailjet is that it just works (for my purposes) - it's very easy to setup and very easy to get SPF/DKIM working properly. 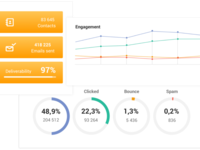 It also provides insight into how your mail is being delivered which is great for both marketing insight and troubleshooting. Cons: The DKIM key length is not user adjustable (to my knowledge) and longer than one my registrar's (namecheap) supports. Overall: I don't have to maintain my own e-mail relay and don't have to worry about my e-mail bouncing. Pros: The API is simple, clear and well documented. Cons: I only use the API for use as a mail server to send email from websites. There is nothing I don't like about it. Overall: Mailjet solves the problem presented by scripting your unregistered email sends. Many mail clients treat unregistered email as spam. Pros: it works! even free version is full of features needed by a small online business to run smoothly the every day e-mail needs. Subscription forms need some work. Mailjet needs to be more proactive with their third party integrations. Overall: We moved from MailMonkey (you know who I mean) and I'm delighted we did. Mailjet is a grown up version offering better value for money and they don't hassle you every few days (like others do) to upgrade or buy more. Worth the switch - importing lists is easy. Have used Mailjet since 2011 across multiple businesses and clients. Pros: Easy to set up and configure for multiple delivery platforms, and consistently reliable. Excellent delivery rates. Comments: We are using the SMPT service of Mailjet as SMTP Relay Server for our own local email server. The amount of monthly emails is still free, but even if we would have to upgrade, it would be quite affordable. So far we have no problems, the setup process is easy and the web page provides all information and administration tools we need. Cons: The handling of the sender domains could be easier. You have to save a txt file on your homepage and this was in our case not easy to organise. Recommendations to other buyers: Test it out as it for free so you don't risk anything and are able to verify, if the service is what you need. Pros: I run a webmail client on my email server, and can usually only send and receive via that webmail client..... but with mailjet's SMTP service, I can use ANY email client on mobile or pc to check mail on the go!! Love it!! Cons: NO CONS WHATSOEVER!! I have not yet experienced anything negative at all!!! Overall: Mailjet allows my email to be accessed universally regardless of platform!!! The experience had been absolutely superb!! Pros: Mailjet is quite fair in price, good technically, good API, good and easy to use admin interface. Cons: Support only by email. Recommendations to other buyers: I could recommand Mailjet mainly for the same usage as we do, I mean for operating an app that requires to deliver emails safely. Pros: This product is so easy to use, the price is right, the customer support is outstanding. Cons: Sometimes it takes a bit of time to find what you are looking for in the portal but once you are accustomed to the setup it goes much faster. Pros: Easy to use drag and drop email template builder, pricing of email sends is low comparing with other softwares in the industry. Good for starters who are into email marketing. Cons: Delivery of emails for new accounts is limited to very low quantity. They deliver very low 20-30 emails per 30 minutes for new marketers. Overall: I have used Mailjet for delivering my Marketing emails. Over all good but if you don't get response to your list in starting days they stop your delivery. So you have start your campaign with sending recent responders so that you will some responses and they deliver your full campaign. - All options which I need are available. - Keeps developing. I see a lot of new options every once in a while. - Customer support is top notch. Cons: - Can be a bit laggy at times. - In some cases I need to delete things which I can't. For example segmentations which I don't need anymore. Overall: Sending my marketing and transactional emails without any problems and with a lot of ease. Overall: It helps you to know exactly what is the status of your deliveries. It helps you to choose the exact campaign and contact list. A mailing service that doesn't charge for the number of subscribers. Pros: The Price: it doesn't charge you for the number of subscribers you have, instead it gives you a maximum numbers of mails you can send/month. This is a very welcome policy for a small non-profit organization like ours, who don't send a lot of emails, but do have quite a variety of subscribers-lists (different target groups). Cons: The features are somewhat limited; it does offer a lot on paper, but; f.e. we would like to use segmentation according to specific target groups (education levels). Mailjet seems to be able to do this in theory, but in practice it would seem to require quite some coding, and it isn't so user-friendly. Cons: If you have payment issues, there system automatics downgrade without any warning. So the next time, your discounts are gone. Pros: I've used both SendGrid and MailChimp in the past, but I have to say MailJet nails both email drip campaigns and SaaS email send-outs (like Sign-up, Forgot password) magnificently. This allows us to run our SaaS application using MailJet, and automatically handle drip campaigns for Patch updates and Newsletter without using CSVs to move subscription lists between systems. One-stop shop for email. Cons: The previous campaign flow was a little counter-intuitive in terms of UX, but this has now been fixed since a couple of months. Overall: As mentioned before, it handles email send-outs magnificently in combination with drip-campaigns. We had an issue in the time before we used MailJet when someone mis-used our SaaS by hijacking our invitation flow to send spam. MailJet would have prevented this, as they monitor any undeliverable emails and automatically blocks send-outs. Also, the MailJet free tier is veery generous. Pros: Free plan. Intuative interface. DKIM / DMARC Recording checking. Cons: Some of messages relayed appear in the 'forum' tabs of gmail but that's possibly due to misconfiguraiton on my part somehwere. Overall: I've been forced to use such company due to running a google cloud instance that doesn't allow outbound SMTP. Thankfully, Mailjet offer a free plan which is enough to get you up and running. I find the website easy to navigate. It checks DKIM & DMARC status and provides easy instructions on how to correct such records. I've had to use support which was prompt and helpful considering I'm on a free plan and have been for a year or so. I've not used any of the e-mail marketing functions so I'm unable to comment on those services but it certainly serves for me as a message relay service and I'm not sure what more it could offer. Any issue we've had was solved quickly. It's a reliable and efficient service. Pros: Mailjet is extremely easy to use. With it I can track emails sent and usage. Each time I have had an issue, customer support was able to resolve it within 24 hours. It's great and easy to use, however, it is buggy and needs refinement. Pros: Ease of use to setup, administer and monitor. Configuring templates, contact lists are easy as a breeze. The scheduling is easy to manage and view the stats. Cons: Navigation is difficult and a pain especially with multiple campaigns and multiple lists. The software tends to be very buggy and needs refinement. Feels that the developers have released the stable alpha version of the software. Support options are not easily available. This needs major refinement. 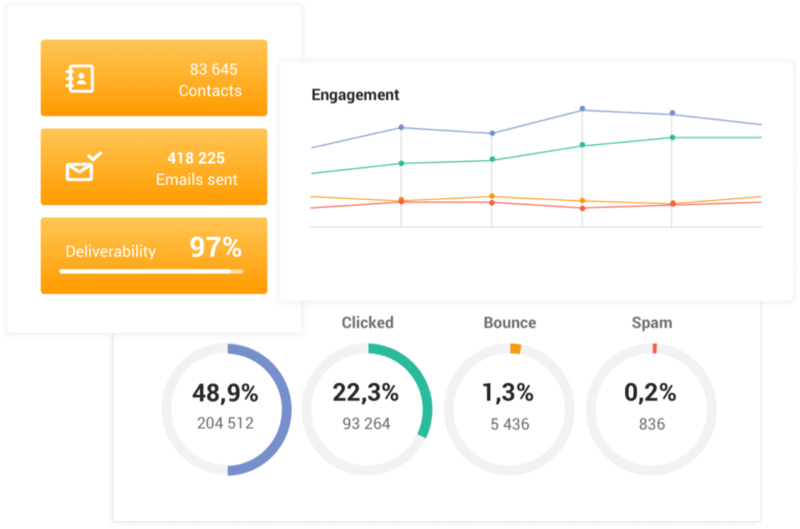 Overall: Ease of use, detailed campaign insights and reports, easy monitoring of campaigns and schedules. The major plus point is that this software actually does what it is supposed to do - actually send emails!! There are some softwares that claim to send emails but actually do not. Designing emails and populating it with content is easy as a breeze. Configuring and testing the campaigns is easy to work with. Overall, it is easy to use, however, the software is buggy and needs work. Pros: Ability to search by email address to see the list of emails sent. What's great is that it shows the email subject and status so you can show what was sent, when and when it was delivered. Cons: Very manual process to get someone unblocked and can be slow. We've also had a problem with our server config so that it sent thousands of email requests to an email address that didn't exist (the mx record didn't even exist!!). We didn't receive an alert of this and got charged hundreds of pounds. Pros: The UI is clear and the configuration process is very straightforward. I use it primarily to automate notifications from a DVR and it works perfectly. Cons: During my regular use, I haven't come across any difficulties. The setup process for the app that I am currently using was very simple to implement. Pros: Easy to use and intuitive interface. Ability to create templates, schedule email deployments and most importantly we were able to segment sub-accounts at no additional cost via our agency account for our various clients. Cons: When setting up a new client and/or importing a new subscriber list there is a chance that if they've not been emailed prior you might trip the sensors if your spam/unsub rate is even a little high. Ensure you have a squeaky clean list prior to importing. Overall: I was thinking how to send e-mail to my all customers at the same time. One day my friend suggested to use these site. I checked and surprised because i reached my goal with this. Day by day i found here more useful. I'm using Mailjet to send newsletters once a week, to more than 15 000 receivers per month. Pros: Mailjet provides a lot of interessant statistics. It gives us an overview of how our messages are treated. Cons: Mailjet should warn us when some services are suddenly blocked... Even if it's caused by our credit card payment. How can I notice that there is something wrong if I don't get any warning ? Neat, clean and trouble free. Pros: The interface is good, which means it's easy to get started. The choice of templates lets you send better-looking mailers. The reporting is excellent, allowing you to drill down into the response data and see where you have been most successful. The 200 free per day is generous, given that you can schedule five different mailers to a total of 1000 people over a working week. The scheduling tool allows your message to arrive at the most opportune time. Cons: Some of the setup procedures are a bit clunky, particularly reusing previous text and layouts. I suppose the five point certification statement about opt-in is a necessary evil. In the reporting it would be useful to know more about the nature of the bounces, or even the detail of the message. Overall: Easier marketing to a potentially large number of potential customers. Pros: The templates are great and easy to use/setup. Competitive pricing, great customer service. Have not really had any issues with it, and the email marketing has been very effective for our business. Cons: It gives you a certain number of emails per month, which can drive the price up if you go over that number. Good idea to check the different plans to be sure you are not spending more than you need to. It does not integrate automatically with paypal, but if you get Zapier that will solve the problem. Just adds an extra monthly fee when you are cost comparing to other products. Overall: Nice looking templates, and effective email marketing.